Part of their new digs. Shelter from the ice and storms. "No more icy lakes and grounds of freeze!...." "No more taunting dogs or rowdy teens. No more discarded fishing lines and icy lake of freeze. No more "Geese Police" and actions to harass and tease. We are finally home free!" So sing the "fab four" domestic ducks from Harlem Meer in Central Park these days. Conner, Carol, Connie and the forever cute and rolely, poley Cochise were rescued two days ago and have already gone to their new home where they are finally able to relax in peace for the rest of their days and enjoy shelter from the storms. Special thanks and deep appreciation to Caroline who helped, not only in the actual rescue of the fab four, but also in securing permission to rescue from park rangers and officials, as well as in responsible and loving, permanent placement of the domestic ducks. Put simply, this could not have been achieved without Caroline. The rescue itself went remarkably and surprisingly smoothly -- though not without a hitch. The day of the actual rescue however, came with some surprise and unanticipated event. Temperatures had plunged to freezing and the ducks sought protection from gusty winds by huddling in marshes to the far east side of the lake -- an area I had never seen them before. Unfortunately, it was far from their usual location -- the grassy, protected area near the Dana Center -- where Caroline had set up a pen to facilitate our hopeful capture of them. It thus became my "job" to try and entice the ducks all the way back to where the rescue pen and Caroline was set up for them -- a distance of nearly a football field! But, would Conner, Connie, Carol and Cochise follow me -- especially that distance? They weren't after all, trained dogs. But, they were very hungry ducks. And they knew me for more than a year as their feeder. Though feeling initially pessimistic that I could lead the ducks all the way back from their semi-warm spot, spirits lifted when they immediately squawked and became excited when seeing me. "No, no, not here!" I said, waving my arms in the direction towards the Dana Center. Sure enough, the ducks began to follow, swimming in a straight line towards the rescue area! But, the journey had twists and turns. At one point in the twists and turns, the fab four embarked on land and started following me along a pedestrian path! Though feeling like the Pied Piper, this was no good as people were walking dogs along the path! "No, no,not here...back in the water!" I said, steering them back to the lake. Thankfully, they got the message and returned to water. This venture went on for a good 15 minutes or so, but finally I and my (apparently) "trained" ducks made our way to where Caroline was patiently waiting with a big bowl of duck pellets and a steel pen with open top. Already acclimated in the prior few days to eating from a bowl, the hungry four made their way to the food and started scooping up. Some mallards joined them in grabbing loose tidbits from the ground. Caroline quickly went inside the pen and closed it off. The mallards immediately flew out. But being flightless, the domestic four were thus "trapped" and enclosed. Once handing a fairly large dog carrier to Caroline over the pen, it seemed mere seconds before she had all four ducks safely secured in the carrier. Two onlookers visiting from England, offered to help Caroline and I move the carrier filled with four heavy ducks back to Caroline's car which was parked a block away outside of the park. 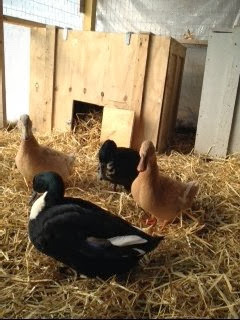 "You will have quite a story to tell when you get back to the UK -- how you helped to save four ducks in America!" I laughed to the young couple. No worse the wear for their "ordeal," Conner, Carol, Connie and Cochise chatted and happily squawked in the back seat of the car, though they did not struggle nor make any attempt at escape. "No more taunting dogs or rowdy teens! No more discarded fishing lines and icy lake of freeze. No more "Geese Police" and actions to harass and tease. We are finally on our way home free!" By the next morning, the fab four were enjoying grassy, fenced-in lawn, water, hay, the company of others just like them, safe shelter and a devoted, human family. I already miss my "fab four," but in the end, one must do what is right for the animals, rather than what just gratifies the ego. Conner, Connie, Carol and Cochise will learn to love others as they have appreciated and responded to me over the past year. I was just the helping hand along the way until they could find real peace and ultimate, safe sanctuary. I am greatly relieved (and forever grateful and indebted to Caroline) that these four domestic ducks will not meet the same grim fate of too many domestics before them and probably too many after them. For some animals dumped in public parks, there can be eventual happy ending. Our job is to increase those odds in their favor and help create more such happy endings. God bless you and Caroline! Wonderful news for the Fab Four, thanks to Caroline and You. THANK YOU!